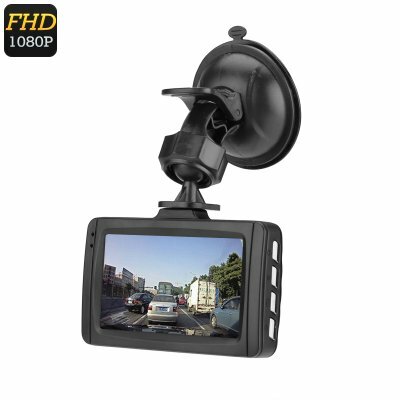 Successfully Added Full-HD Car DVR Camera - 1080p, 140-Degree Lens, 1/4-Inch CMOS, 3-Inch Display, G-Sensor, Motion Detection to your Shopping Cart. With this beautiful 3-Inch car DVR system you’ll be able to shoot clear and Full-HD footage from your dashboard at any time of the day. Whether you simply use it to record the surroundings during your upcoming holiday, or to increase your safety on the road by capturing evidence of potential traffic accidents – this 1080p dash camera is there to meet all your demands. With its 140-degree wide angle lens, this car black box does not only record everything that happens in front of your car, but also that what’s going on next to the road – providing footage with a clear overview of the entire situation. From now on you can be assured that not a single detail of evidence gets lost as with this car DVR camera you’ll record everything that happens around your car in stunning detail. Equipped with a high-end 1/4 Inch CMOS sensor, this dashcam is capable of shooting high quality footage – ensuring that even the slightest of details are clearly visible. Recording images in a stunning 1080p resolution at 25fps, this car black box provides sharp images even while moving at high-speed. Additionally, this car DVR system is also capable of capturing 12MP photographs. Along with its motion detection feature, this 12MP camera is able to snap detailed pictures whenever motion is detected in the area of the car – guaranteeing that you’ll always have the picture evidence necessary in case something happens to your car when you’re not around. At the rear of this Full-HD car DVR system you’ll find a beautiful 3-Inch TFT LCD display that lets you conveniently navigate through its features and set the right settings. This stunning display additionally allows you to watch back any previously made recordings instantly at the side of the road – providing you with all the means necessary to settle minor roadside disputes without needing to get law enforcement involved. Additionally, it packs a sophisticated 180mAh battery that provides you with 30 minutes of usage time when the camera is not connected to your car. This gives you the possibility to use it as a regular 12MP camera and to shoot beautiful pictures whenever you come across something interesting during your upcoming holidays. With its advanced G-sensor, this car black box automatically saves your recording at the moment of impact, guaranteeing that not a single second of evidence gets lost in the aftermath of a potential traffic accident. With its 32GB of internal storage, you can be assured that this car DVR camera always packs enough storage to save all your recordings. From now on, you will always be able to record whatever is happening within your car’s surroundings in highly detailed 1080p resolution, ensuring that you’ll never get confronted with false insurance claims again. This 3-Inch car DVR system comes with a 12 months warranty, brought to you by the leader in electronic devices as well as wholesale electronic gadgets..
Arabic: - سيارة دفر الكاميرا - Chinese Simplified: - 汽车 DVR 相机 - Czech: - Auto DVR kamera - Danish: - Bil DVR kamera - Dutch: - Car DVR Camera - French: - Caméra DVR voiture - German: - Auto DVR Kamera - Hebrew: - מצלמת רכב DVR - Hindi: - कार DVR कैमरा - Italian: - Macchina fotografica del DVR - Japanese: - 車 DVR カメラ - Korean: - 자동차 DVR 카메라 - Malay: - Kereta DVR kamera - Norwegian Bokmål: - Bil DVR Camera - Romanian: - Cameră de DVR auto - Russian: - Автомобильный Видеорегистратор камеры - Spanish: - CAMARA DVR - Thai: - กล้อง DVR ในรถ - Turkish: - Araba DVR kamera - Vietnamese: - Xe hơi ghi hình Camera.